How could it have come so far? The Brexit train is heading towards its fateful moment on March 29, 2019 and nobody is willing to slam on the breaks, at least not yet. It appears that Prime Minister Theresa May will offer the British House of Parliament an unsavory choice shortly before the exit date: change your mind and vote for the (perhaps marginally revised) exit agreement negotiated with the European Union, which was rejected in the first round by the House of Commons in January, or face a no-deal exit that will cause significant economic hardship. It is more likely than not that this new vote will fail the same way the first one did, and then Britain will be headed for a no-deal "hard Brexit"—unless Parliament slams on the breaks. 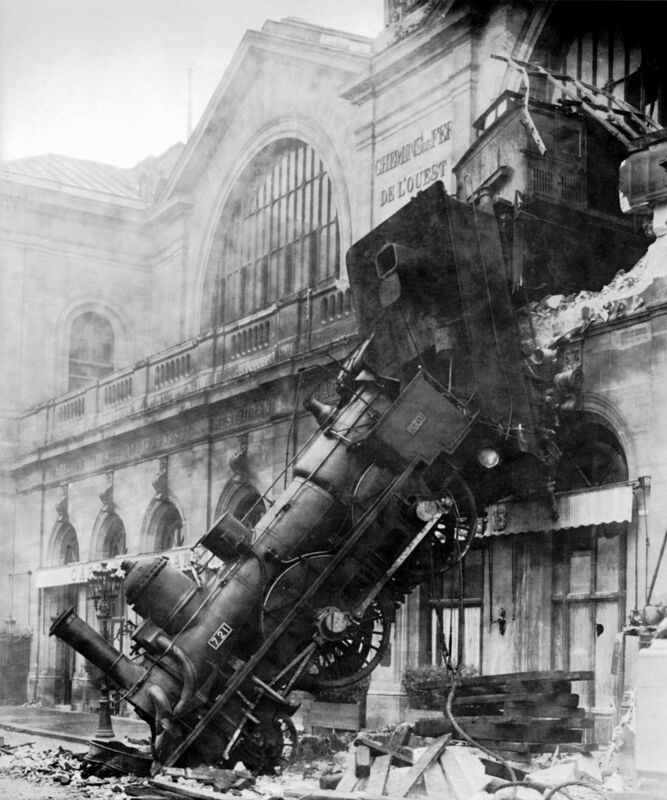 Whether the breaks will be working is not known, and perhaps the breaks won't work fast enough as was the case in the famous train crash at Montparnasse station in Paris in 1895 (pictured above right). A no-deal Brexit is a real possibility at this point, and businesses are preparing already for this eventuality. The "Leave" supporters claim that a no-deal Brexit is no big deal and everything will be fine. Of course, they are mistaken. Even if there is no great chaos and no massive line-ups of trucks with rotting food at the border (I agree with Tom Kibasi's point of view in his article A no-deal Brexit won't result in a siege; the EU will be more clinical than that in The Guardian), the economic costs will materialize unforgivingly in the months and years to come. Worse, the peace brought to Ireland through the Good Friday Agreement will be in jeopardy if a hard border goes up between North and South. Britain will lose access to its key export market in return for what? In an interconnected world, the pure sovereignty that "Leavers" dream of is just that: a dream. Modern economies are connected through myriads of economic and political ties, and severing these ties diminishes influence and power. British GDP is going to suffer, and researchers put this number at 100 billion pounds a year. The economic damage from the Brexit process is real already. Companies such as Nissan are holding off new investments and decide against moving production there (Nissan to cancel plans to make X-Trail SUV in UK). Perhaps Brexit is not alone to blame for Nissan's woes, but Brexit is surely a big contributing factor (Nissan snubs Sunderland. Is Brexit to blame?). Even generous government incentives didn't sway Nissan. Hundreds of jobs will depart. It has been reported that banks and other financial companies have shifted at least US$1 trillion worth of assets out of Britain and into the European Union because of Brexit. Goldman Sachs, Citibank and Deutsche Bank have moved hundreds of jobs to Dublin, Luxembourg, Frankfurt and Paris. So if another parliamentary vote fails to secure an exit deal close to the end-of-March deadline, then what? It will come down to Parliament asserting its desire to avoid a no-deal Brexit and ask for an extension of Article 50, if the EU is agreeable to that. There is a chance that the EU will agree to a limited extension, but why give Britain more time if there is no clear vision where the train is headed? Of course, Britain can withdraw from Article 50 altogether, but that is probably politically unthinkable absent a second referendum. So Britain is caught in a deadlock. There is no better deal to be negotiated than the one on the table, and if that deal is not good enough, then Britain can decide if they want a worse deal (Norway-style affiliation or Canada-style free trade), or crash out of the EU without a deal, which is the worst outcome of all. But how could it have come so far in the first place? Why do "Leavers" believe that the European Union is a threat to British sovereignty? At the root of it all is a false belief that the European Union has usurped too much power and is strangling the UK with burdensome regulations. Of course, there is also the anti-immigration sentiment stirred into this argument, and this may well be a stronger emotional factor than the concerns about an overpowering EU bureaucracy. What is largely to blame for the anti-EU sentiment in the UK is a long list of falsehoods perpetuated in the press. Myths and outright lies have stirred this anti-EU sentiment for far too long. A number of media outlets have misreported on EU policies, or falsely attributed policies to the EU Commission. The European Commission has collected an astoundingly long list of all these falsehoods and distortions in its Euromyths A-Z Index, 1992-2017. They range from false assertions that the EU was about to harmonize the size of condoms across EU countries or that the EU plans to liquefy corpses and pour them down the drain, from outlawing darts in pubs to outlawing imperial units of measurement such as the ounce and pound. All utter nonsense. The EU has never had such plans. But such myths are too easily believed when people see them in black and white in a newspaper. Such false and distorted reports too easily feed and nourish a latent anti-EU sentiment. It is plain fear-mongering, a popular activity for many politicians. The Economist magazine published an article Debunking years of tabloid claims about Europe in June 2016 that referenced the EU web site for. It identified three newspapers as the main culprit of perpetuating these myths: Daily Mail, Daily Telegraph, and Daily Express. The most popular topic for an EU myth involved food, followed by public services. A common theme is that EU rules discriminate somehow against UK citizens. For example, a new EU rule was adopted to prevent those fined for driving dangerously in an EU country to avoid paying the fine because they live in another EU country. Instead, it was portrayed (by the Express) as if Britain was told what speeding fines to impose. That is patently false. Nations can still set their own fines. The point is that British drivers fined in another EU country would have to pay up, as do drivers from other EU countries committing a traffic offense in Britain. This is a reciprocity rule, and Britain is at liberty to design and manager their own fines. The train continues speeding up. The bookmakers indicate a probability of 25-35% of a no-deal exit, and a probability of 75% for an Article 50 extension. Among these two, the latter outcome is still the more sensible route to take for Britain. Greater sovereignty will come at the price of a Norway-style customs union membership or a Canada-style free trade agreement. Britain won't have its cake and eat it too; the EU will sit firm to protect its remaining members, and in particular the Republic of Ireland. The Economist magazine described Britain's crisis as Brexit, mother of all messes and called for more time and a second referendum. Ultimately, voters probably need to be given a second chance to sort out the mess they created—and hopefully with a better set of information about what is feasible, what is not, and what is truth, and what is myth. There is nothing wrong with voters or legislators having a second look at issues when circumstances have changed and better and more complete information has become available. Some pundits think a second referendum is anti-democratic—and even elitist—because it would have parliament judge the original vote as somehow deficient or ill-informed. But that argument is flawed. If politicians can't decide on a clear direction because the direction they got from the original mandate wasn't clear, then why not turn back to the voters for clearer direction? A lot more information is now available than when the first referendum was held. Arguably, voters deserve a chance at "sober second thought". Perhaps they will reaffirm their desire to leave the EU, and perhaps they will not. But voters should be given a set of options that are feasible: leave the EU without a deal and start negotiating free-trade agreements from scratch (and suffer the economic consequence); enter a Norway-style EU affiliation with access to the Common Market and the obligations that come with it; or stay in the EU. It comes down to offering clear choices to voters. There is just one thing that's not on the menu: have your cake and eat it too. But that is what was offered to voters in the first referendum.